Combine all ingredients except the salmon and mix well. Lay out a large sheet of plastic wrap. Sprinkle half of the mixture over the plastic wrap, in the shape of the salmon fillet. Place the salmon on the salt mixture. Cover with the remaining salt mixture. Fully enclose with the plastic wrap. Place the pan in a baking dish. Place a pan on top of the salmon and weight it down with a few canned goods or a brick. Use about 5 pounds worth. Refrigerate for 24 hours. Remove the weights and pan and flip the salmon. Place the weights and salmon bacon on the wrapped salmon. Repeat this every 24 hours until the salmon should be firm to the touch at the thickest part, and fully cured after 3 days. 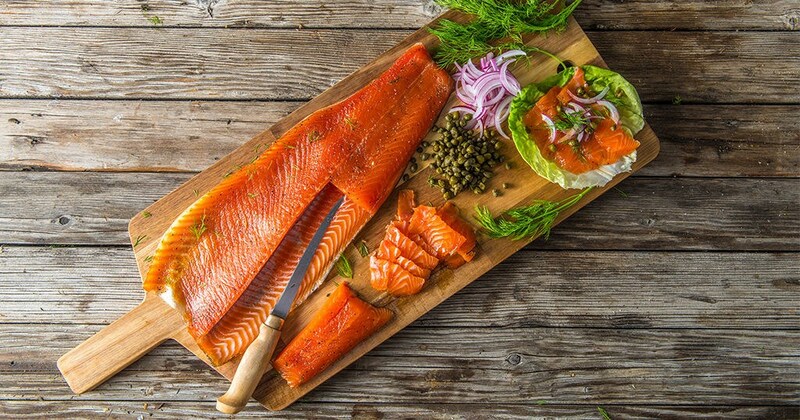 When the salmon is fully cured, rinse it well under cool water, and pat it dry. Place on a wire rack over a sheet pan and place in the refrigerator. Let sit open for 8-12 hours to form the pellicle. Place an A-MAZE-N Tube Smoker in your Yoder Smokers YS640 pellet grill. Fill with cherry pellets and light with a torch. Blow the flame out after 30 seconds of burning. Turn the grill “on” but do not hit start. This will allow the fans to force air through the grill without creating heat. Smoke for 3-5 hours. Remove from the grill. Chill. Slice to serve. Note: To toast peppercorns, or any whole spices, heat them gently in a small dry skillet until they begin to release their fragrance, a few minutes.